DeSean Jackson is a supreme jerk. He was one of four Redskin team members to raise their fists during the National Anthem. It is the symbol of Black Power and a racist, violent gesture. It is extremely disrespectful to do it during the National Anthem. Colin Kaepernick started this lunacy, but it has spread far and wide now. This one goes a step too far. A number of football players were fined for wearing special cleats honoring 9/11. The commissioner fined them $6,000 a piece as I understand it. Well, Jackson had some special cleats made as well. They are a slap at police officers. Caution tape is painted on them depicting a crime scene. I wonder if the commissioner will fine him too for violating regulations? I doubt it… Goodell is a big supporter of Black Lives Matter. It’s one of many reasons he should step down. 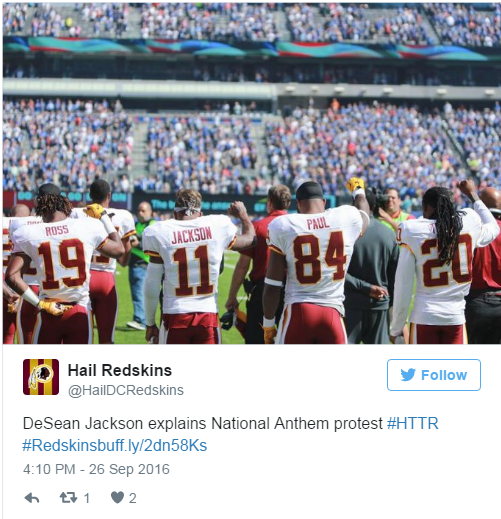 Last Sunday, Washington Redskin DeSean Jackson was one of four teammates to raise his fist during the national anthem. “We feel like there’s a lot going on out there in our country now, and we feel like we have an opportunity to be seen and be heard, so we just want to support our people in a time of crisis like this, where you have a lot of tragic situations, a lot of people losing their family members due to these senseless killings by police officers. We just want to make a stand, and I think putting our fists up to support our culture is something important. We feel like something dramatic needs to happen in this society, in our country now with all the things going on, the conversation. Yet, protesting the anthem isn’t enough for Jackson. 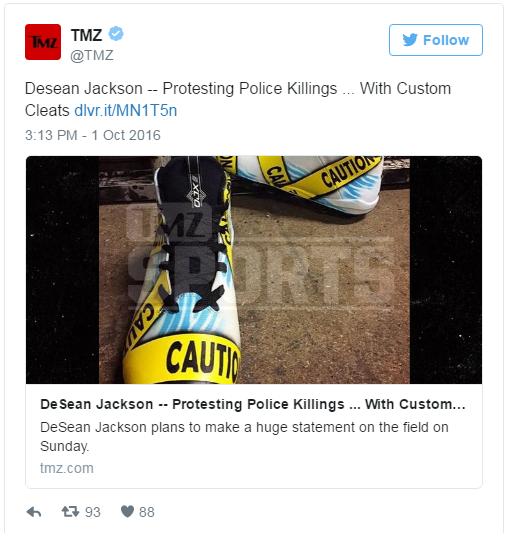 In fact, he commissioned an artist to give a makeover to his cleats as a way to visually protest cop-involved shootings. “I’ve seen enough yellow caution tape and it’s time for a stand and a change in our community and society. Senseless killings have been ongoing for awhile and police brutality in our black community … and as a young black leader with a stage and platform I’m starting awareness to help prevent these killings, and hopefully get justice to these cops who have taken lives of innocent human beings. Jackson will wear the cleats to practice, but no word on whether he’ll wear them at game time. Pity… I join millions who won’t be watching anyway because of this crap. It’s hard to posture and make a stand when nobody is watching you and doesn’t give a fig what you do.